Snap jigging for walleye is a key technique in late spring and early summer. If you want to catch limits of big walleyes right now, take this guide’s advice and start snapping them up. The jig slips into a world of minnows. It rises and drifts, pops and slides. Clearly different, somehow the same, it looks right at home but stands out. It’s getting away, and now it’s not. Snap jigging is the act of “popping” a jig so it rapidly darts upward in the water column, then slowly descends back toward the bottom. The fast, escaping baitfish action gets the fish’s attention because an easy meal is getting away, and the fish often strike on the drop. Usually the physical movement is a quick wrist move like snapping a yo-yo back up to your hand, but intensity if modified depending on various factors, including the mood of the fish. During the early season, Sundin likes a softer, shorter snap that doesn’t pull the bait too far from the fish. Sundin plies his dialed-down version of snap jigging when walleyes are shallow. Classic snap jigging requires heavy stuff, moving quickly and covering water at a fast clip. Sundin, though, isn’t as aggressive as some guys during the early season. He uses a 6 ½-foot, medium-light power spinning rod and 4- to 6-pound line, and tries to keep the boat at or below 1 mph. He also restrains his actual jigging, moving the jig only 5 to 6 inches at a time. 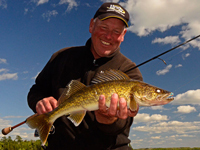 Sundin pitches the jig a “comfortable, short distance” when walleyes are in 5 feet of water or less. As the jig sinks, he starts with the rod tip pointing up at 11 o’clock. As it touches bottom, he drops the rod tip to create slack then snaps it back up. 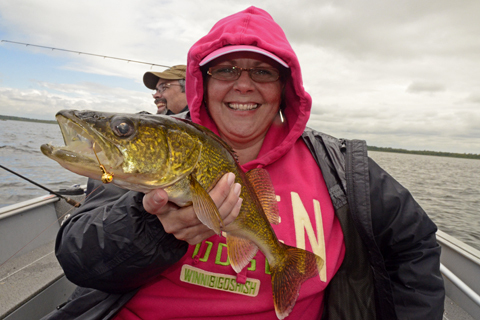 Early walleyes are shallow walleyes. Until surface temperatures hit the mid 60s, walleyes will be where the bait is. After a long, hard winter, baitfish want to be in the warmest available water, which tends to be close to the bank. Add baitfish spawns into the equation and there’s another reason for shallow walleyes. Shiners and perch are the most important forage in Sundin’s neck of the woods. Jig weight is based on where the fish are. At the earliest stages of summer, Sundin is still using 1/8-ounce jigs. He starts out in spring with a 1/16-ounce Lindy Jig tipped with a shiner, rainbow, or fathead in that order of preference. When the water hits the mid 50s and perch are spawning in depths of 4 to 6 feet, he moves up to a 1/8-ounce jig. 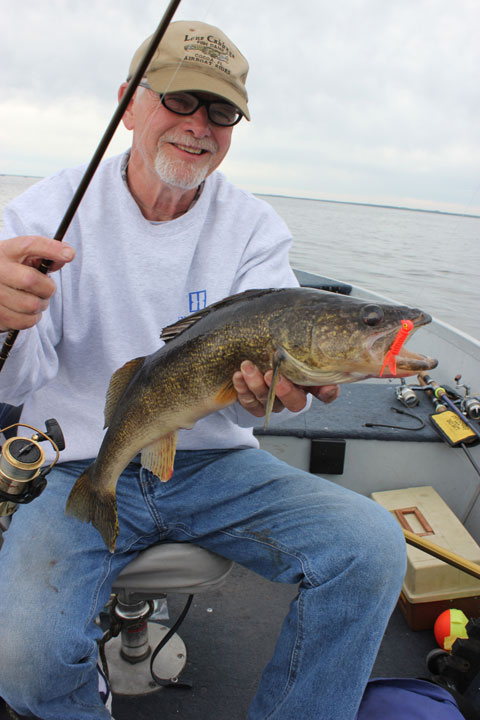 On wind-swept, sandy lakes with a lot of sand grass and few taller weedlines, Sundin finds walleyes doubling back into the shallows a lot in summer, especially shallow rocks in 4 to 7 feet of water. When this occurs, he often throws a Watsit Jig minus the bait. Snap jigging is effective any time walleyes are in relatively shallow water regardless of time of year. Most of the time the only reason the fish are in less than 8 feet of water is because that’s where the food is, so they’re susceptible to a jig popped up right in front of their faces. Snap, drift, pop. Sounds like a breakfast cereal. But in practice, Sundin’s version of snap jigging is more like Muhammad Ali. It floats like a butterfly, stings like a bee.